My knowledge of the comic book world is pretty sketchy. Although I grew up with an older brother who naturally immersed himself in comics, I never delved too deeply into them. Fox cartoons of X-men and Spider-Man, The Incredible Hulk on Sega Genesis and the Superman films were my ways of learning about the world of DC and Marvel before the internet. Because of this I was somehow completely ignorant to the character Thor when going into the film. In fact, I had seen a preview of Captain America and somehow convinced myself that was what I was seeing when I bought my ticket for Thor (god knows contemporary films set during the Nazi régime makes me weak in the knees with excitement). 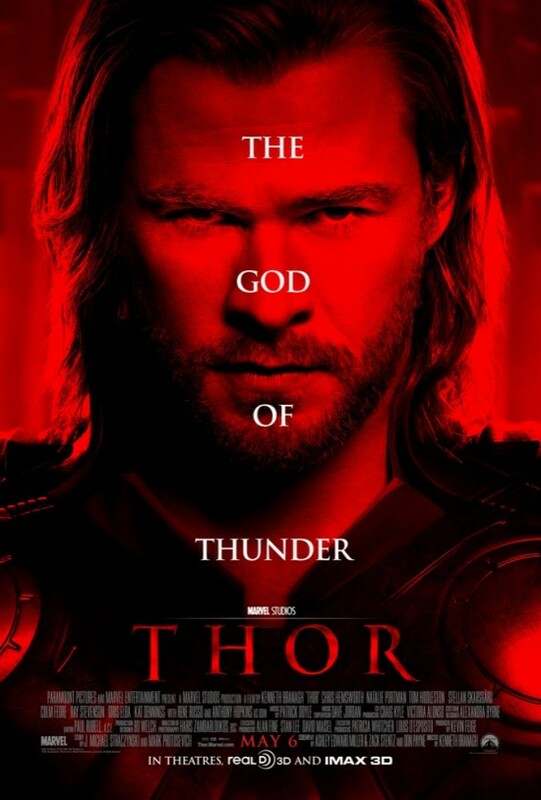 It wasn’t until sitting through the trailers and seeing the one for Captain America that it hit me that I was actually seeing Thor, and then I thought, “Wait who the hell is Thor?” The confusion, however, allowed me to for once sit through a film that I had absolutely no prior knowledge of; story, actors and universe included. Thor isn’t anything above average as a film but it’s essentially an enjoyable film and fun cinematic experience that doesn’t disappoint. For those wondering what rock I’ve been living under to know nothing of Thor, I welcome your wonder and question the same thing to myself. I was aware of his presence in Viking mythology but just assumed he was a mythical god and later caricature on Dexter’s Laboratory as opposed to a comic book hero. Director Kenneth Branagh does an impressive job telling the story of Thor (Chris Hemsworth), a somewhat hodgepodge of the all the aforementioned characteristics. When a planet inhabited by Frost Giants attempts to destroy Earth and conquer the Nine Realms of the Universe, Odin (Anthony Hopkins), King of one of the realms, Asgard, leads a group of warriors to wage war with the Frost Giants seizing their power and returning peace to the universe for some time. However, time passes and in the present day world Thor’s father is aging and must name a new king among his two sons Thor, a brash, good-looking, head strong warrior and Loki (Tom Hiddleston), the more pensive and fragile of the two. But before a king is named, Frost Giants attack causing an angry Thor to lead a group of friends and warriors to retaliate on the Frost Giants’ home planet, breaking a truce with Asgardians and the Frost Giants. Odin, angry that war has been waged because of his son’s arrogance, banishes a powerless Thor to Earth where he falls into the care of Jane Foster (Natalie Portman), a lonely-hearted, career-driven astrophysicist and her research team. With their help Thor must find a way back home to stop the impending war and prove to his father that he is worthy of the throne. There’s nothing too complex about Thor, which is both the film’s strength and weakness. It doesn’t try too hard which makes fight sequences far from impressive as they are nothing more than a blur of bodies being hit with overly loud thuds for sound effects. The film’s CGI makes Thor’s world and enemies look incredibly cheesy and amateur for a film with such a large budget. Branagh also awkwardly and frequently uses dutch angles which calls to mind the flamboyant and quirky Batman series of the 1960s and doesn’t work for a film about a mythical god and universal war. However, Thor is effective in the fact that it’s simply entertaining and overall contains great moments of character development drawing solid performances from its major actors. Although the comic book world has never been my expertise, I’ve always been a fan of Marvel Comics because of how complex and relatable their characters. Ashley Edward Miller, Zack Stentz and Don Payne’s script cunningly displays the complexities of Thor and Loki throughout the entire film. Both characters are ultimately good people, however, it’s their greed and desire that makes them flawed, a perfect assessment of humans. The density of the major characters results in great scenes and strong performances from Hopkins and Hiddleston. While supporting characters aren’t thoroughly developed, they exist to deliver moments of comic relief, whether the jokes are funny or not. Thor isn’t a gem but it’s no lump of coal either, it’s somewhere in the vein of copper or bronze. It’s a decent balance of family-friendly humor, safe action, romance, and adequate serious content to draw viewers in enough to entertain and please by and at the film’s ending. If you go in not expecting much I can’t imagine being disappointed, however, expecting a grade A film would only set yourself up for disappointment. Thor is the type of movie to watch if you feel like getting out of the house and seeing a film or just have nothing else to do and wouldn’t mind spending money. It’s entertaining enough to stay awake through and for the ladies Hemsworth is beautiful eye candy and Barangh knows it. But don’t fret that you’re missing an important comic book film if you don’t see it, trust me you’re not.